Facebook has published a new set of podcasts which examine industry-specific trends and behaviors on Instagram, revealing a range of key insights that can help marketers looking to tap into their respective Instagram audience. Facebook has thus far produced four podcasts in the series, all of which are around seven minutes long - you can listen to them all here. But if you'd rather read than listen, here's a quick summary of the key findings from each. The first podcast looks at how auto enthusiasts use Instagram, including insights from Stephen Gray, Consumer Insight Analyst at Facebook, and Thomais Zaremba, Global Head of Auto Strategy at Facebook, along with podcast host Katie Duffy, Facebook's Global Content Manager for Consumer Insights. 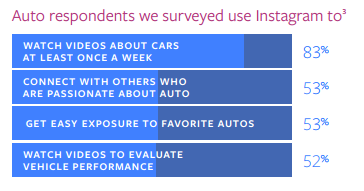 The findings discussed are based on a survey of more than 1,600 auto enthusiasts on Instagram, who have been identified by the hashtags they use and the accounts they follow. 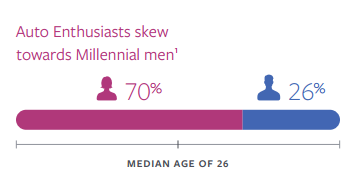 Based on this, their research shows that the average auto enthusiast on Instagram is male, with a median age of 26. Gray notes that auto lovers use Instagram to find images of rare cars and connect with enthusiasts, while they also love that Instagram can connect them with real-world experiences of cars in action, with up to 83% of auto enthusiasts consuming video content about cars on the platform. In terms of hashtags, the most used auto-related tags relate to presentation, again underlining the desire for attractive car images. The research also shows that car enthusiasts use Instagram when looking to buy a car, following dealerships and looking for specific models, while many also noted that they can pose questions on Instagram and get immediate response - both from local enthusiasts and experts from around the world - another big plus. Based on this, Facebook advises that auto marketers looking to capitalize on Instagram should aim to create attractive car images to gain attention, to 'satisfy the need for speed' by using video, and align with the Instagram auto community to build recognition and reputation, helping boost their brand. The second podcast looks at the beauty sector, with insights from Yini Guo, Consumer Insights Researcher at Facebook. Duffy notes that beauty is a major focus for Instagram users, with more than 160 million posts using #beauty, while Guo says that there are over 13 million Instagram in the US to whom beauty and cosmetics are top passions. 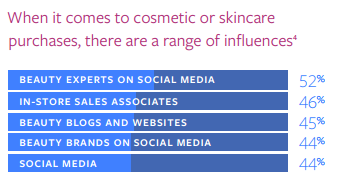 Guo says that 76% of beauty enthusiasts on Instagram are female, with a median age of 27. Guo says that beauty enthusiasts turn to Instagram for a range of reasons, including inspiration, noting that they're more likely to feel 'energized and confident' by finding trends and shared passions on the platform. Guo also notes that Instagram makes beauty enthusiasts feel more connected to people who share their interests - with video tutorials proving particularly popular. In terms of hashtag use, #nailart, #lashes and #skincare are among the top beauty trends on the platform. Guo also notes that there's a strong connection between beauty and the fashion and luxury communities on the platform, which may present an opportunity for co-branding and partnerships with fashion brands or bloggers to help spread the word. Guo also says that 60% of beauty enthusiasts on Instagram users prefer the platform over magazines when looking for new products, while 65% of enthusiasts now use the platform over magazines when trying to stay on top of the latest trends. Based on this, Duffy says that beauty marketers should consider using video and storytelling techniques to showcase the latest trends and tips, tapping into that demand, while also using the platform to identify trending topics and align their messaging with such shifts. Sports is not something most would immediately associate with Instagram, but the research highlights some interesting considerations for sports brands and those looking to reach sports enthusiasts. In this episode, Stephen Gray re-joins Duffy to discuss the latest sports trends on the platform, based on their research of sports enthusiasts. Gray notes that many sports fans turn to Instagram as a one-stop shop for updates, scores, stats and highlights. The median age for sports fans on Instagram is 27, with a fairly even split between genders. 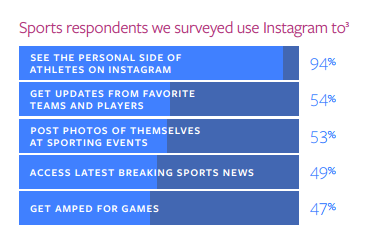 Gray notes that sports fans love using Instagram to stay connected to their favorite athletes and teams, with 94% of sports enthusiasts on the platform noting that they enjoy seeing posts about players' personal lives and behind-the-scenes insights - a kind of exclusive access that they only get through Instagram posts. Another interesting consideration here is the use of this more intimate, behind-the-scenes for another purpose - informing their fantasy sports teams. Fantasy sports is massive, and Gray says that up to a third of Instagram sports enthusiasts use the platform for fantasy research and insights. Gray also notes that surfing, skateboarding and snowboarding fans also like to use Instagram to find hidden spots, which are showcased through their respective on-platform communities. On hashtags, gym and fitness related tags dominate. In fact, 50% of the top 10 accounts that sports enthusiasts follow are related to running - but that may give a somewhat skewed viewpoint as to the potential. In another note, Gray says that a significant number of people come to Instagram for inspiration on how to be more active. In this context, the gym hashtags make sense, but they also use those behind-the-scenes images and insights from professionals they admire to get more information on how to become better athletes themselves, which likely also applies more widely, beyond just running and gym-related activities. And one more key note - Gray says that almost 50% of Instagram sports enthusiasts use the platform to 'get amped' for games, which shows that they use Instagram before, during and after events to stay engaged, presenting significant opportunity for sports-related businesses. The final podcast of this new series looks at travel, and how travel enthusiasts use Instagram to plan and share their experiences. This is a more obvious one for Instagram - the platform has long been about escapism, offering a means for people to get lost in beautiful images. Travel aligns perfectly with this, and as noted by Gray (who, again, is the guest on this episode), there are over 160 million Instagram posts using the hashtag #travel, and up to a million travel-related searches on the platform each week, underlining the popularity of the topic. Among travel enthusiasts, 70% use the platform to share their travel plans, while 67% use Instagram to find inspiration for new journeys. In addition to this, Gray says that 61% of travel enthusiasts find things to do on Instagram while they're traveling, with the platform offering more insight into local cultures and traditions, helping them get a more specific, immersive travel experience. Interestingly, among the top hashtags for travel is #staycation, which relates to staying home. In fact, according to Gray, up to 50% of travel enthusiasts use Instagram to find local places to explore, through day trips and the like. This is an element that many may not be aware of, or be capitalizing on - reaching locals with tourism campaigns doesn't seem immediately obvious, but it may provide significant opportunity, going on this data. In terms of marketing lessons, Duffy says that travel brands should look to share different cultures and unique experiences, tapping into that demand for adventure and deeper connection with place. Duffy also suggests that brands should utilize the interest in local adventures, using video and Instagram Stories to showcase short trips and lesser known local places of interest. There's a heap of great insights here, and key considerations for businesses related to these four sectors - likely some you hadn't thought of. As Instagram's audience and options continue to grow, so too do the opportunities and potential use-cases, which makes it an increasingly important consideration for all brands looking to maximize their use of social marketing.